This easy Easter treat is kid-friendly and fun to make for the family. Baked Donut Nests are a popular Easter dessert, so give it a try this year! Get ready for Easter this year with this super adorable Baked Donut Nests recipe! Your kids and even the adults are going to love this resemblance of a bird’s nest… but it’s edible! Follow the instructions for this easy and affordable recipe to get started! Preheat the oven to 350 degrees. Spray the donut pan with a non-stick spray such as Pam. In a medium-size bowl, combine the dry ingredients – flour, baking powder, salt, and nutmeg. Mix well and set aside. Cream together the butter, and sugar. Add the eggs and vanilla and mix well. Slowly add in the flour mixture stirring well. Once everything is combined slowly add in the milk. 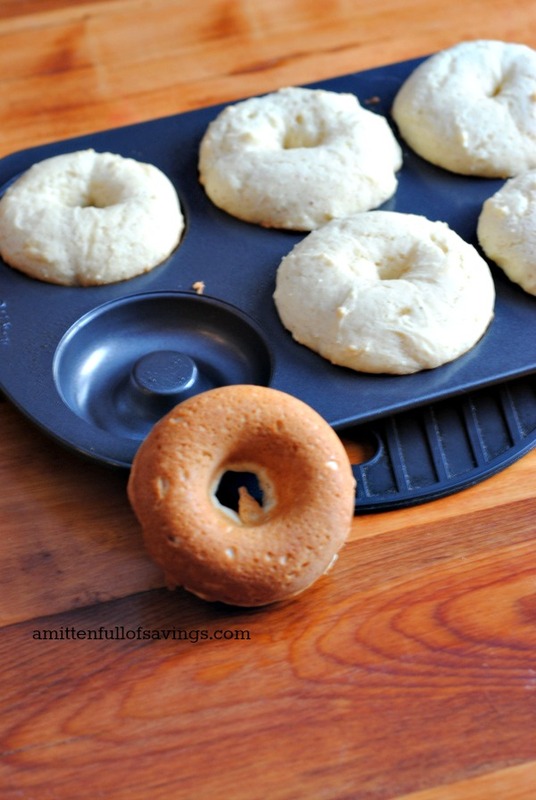 Using a tablespoon scoop the dough into the donut pan and bake for about 12-15 minutes – the tops will turn light brown. When they are done, lay on wax paper and let cool. Repeat with the rest of the dough. Pro-tip: If you want to save time, you can buy donuts from your store, or bakery shop and just add the glaze and toasted coconuts! Turn the broiler on low. Pour the 2 C. of flaked coconut onto a cookie sheet and let sit on the middle rack in the oven for 5-10 minutes so the coconut turns a light shade of brown. Do NOT let overcook. Pull out and let cool. Once the coconut is cooled, place on a plate. While the donuts are cooling – combine the confectioner sugar, milk and vanilla and mix well. You may want to add a few extra tablespoons of milk if the glaze is too thick. You do not want it runny but you want it thin enough so you can ‘dunk’ the donut tops in it. Once the donuts are cooled, dunk the tops of them into the glaze one at a time and then press and roll into the toasted coconut. Place on a plate (or cookie sheet) and add the malted Easter eggs so that the donut resembles a nest. Serve immediately or store in an airtight container for up to 1 week. I do not suggest freezing them. Turn the broiler on low. Pour the 2 C. of flaked coconut onto a cookie sheet and let sit on the middle rack in the oven for 5­10 minutes so the coconut turns a light shade of brown. Do NOT let overcook. Pull out and let cool. While the donuts are cooling – combine the confectioner sugar, milk and vanilla and mix well. You may want to add a few extra tablespoons of milk if the glaze is too thick. You do not want it runny but you want it thin enough so you can ‘dunk’ the donut tops in it. sounds good…how much flour do you use? i couldn’t find the amount? These are so adorable! I’ve seen lots of cute cookie nests, but I’ve never seen a donut one! What a great idea!!! Love it! Amazingly delicious and super cute! Thanks for linking up with What’s Cookin’ Wednesday! These are adorable….you’re being featured. Thanks for linking up to Show Me Saturdays link up party! Hi, my son and I are going to try to make these today, but the salt, vanilla, eggs and milk amounts are not listed in the recipe for the donuts?? I hate to ‘wing it’? If you could let me know those amounts, that would be great, thanks!